Whether it’s for prom, a wedding, wine tour, bachelorette party or weekend getaway, people love the touch of elegance, style, and fun a Cadillac Escalade limousine can bring to their event. If you want a professional, luxurious experience for your next occasion, Anytime Limousine Service has to exceptional staff, fleet options, and ability to go beyond your expectations. 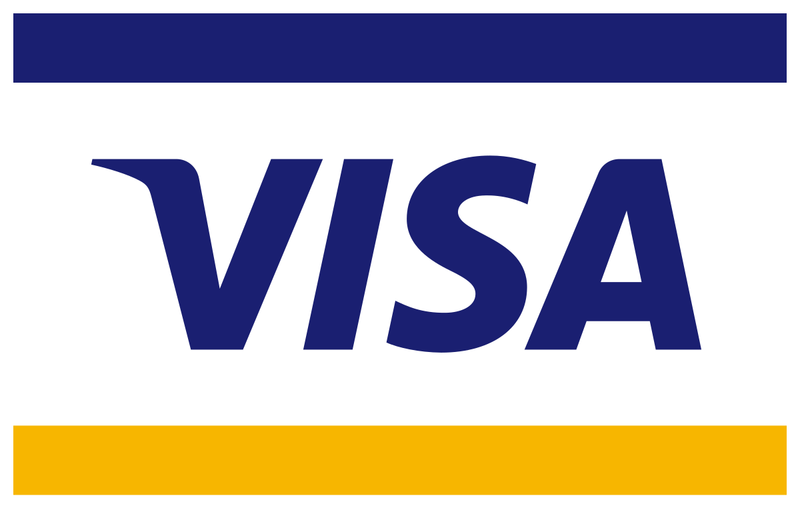 We have competitive rates and are a family owned business since 1997. 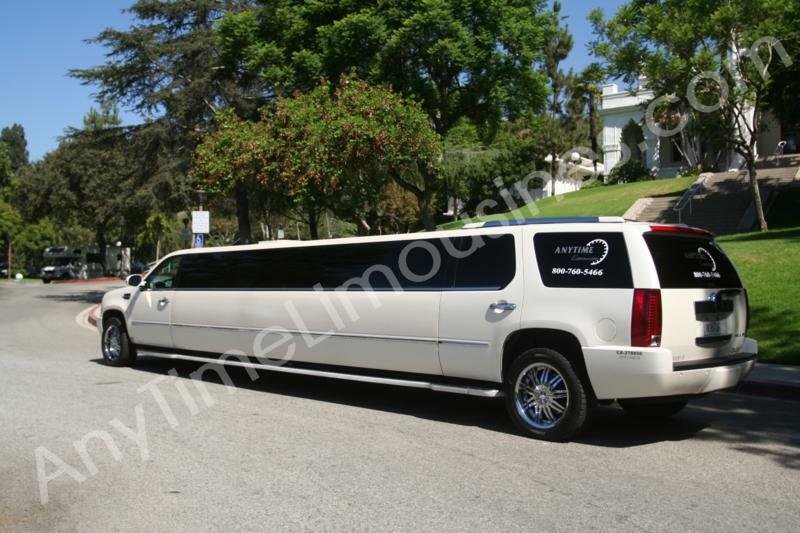 As the top limousine company in Los Angeles, we have a standard of excellence above the rest. 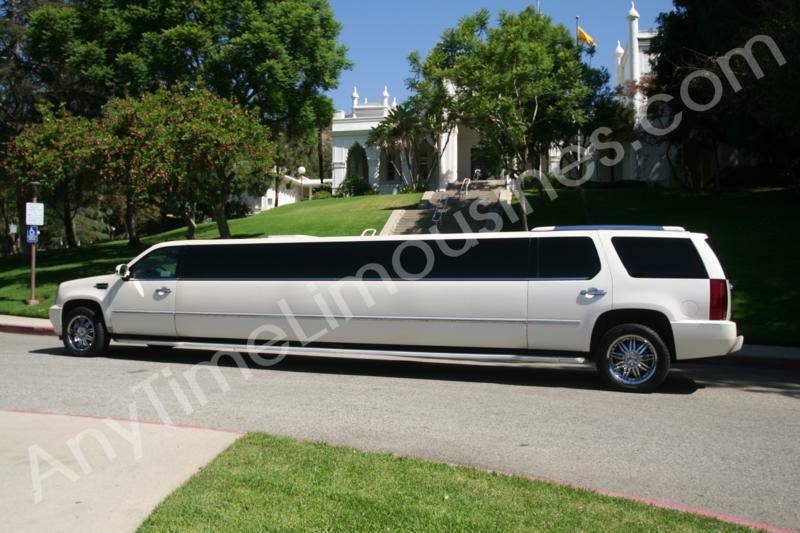 Our Cadillac Escalade Limo redefines comfort and luxury while providing the utmost protection and privacy. A night out on the town can quickly turn sour if there is an accident or if there is no designated driver. Having a limo available to you provides the option of staying out as late as you want without having to worry about how you will get home. Our drivers are certified and experienced to get you where you need to go safely and with any worry. 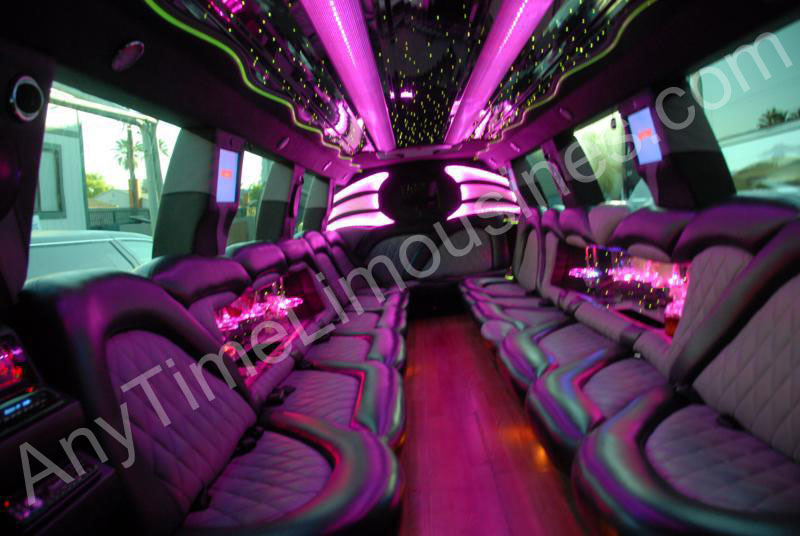 One of our top priorities at Anytime Limousines is offering competitive rates that can accommodate different budgets. Renting a Cadillac Escalade in LA, should not be out of your reach because of the cost! 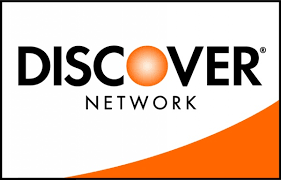 Contact us for exclusive deals that you will not find anywhere else. Plenty of clients regard the Cadillac Escalade as a form of luxury transportation synonymous with class and extravagance. Our Escalades are reliable, comfortable and greatly designed inside and out, with traveling passenger luxury and security needs in mind. When you are in need of luxury transportation our Cadillac Escalade, and Cadillac Escalade limo is unequaled, nothing can match the standards and engineering performance. 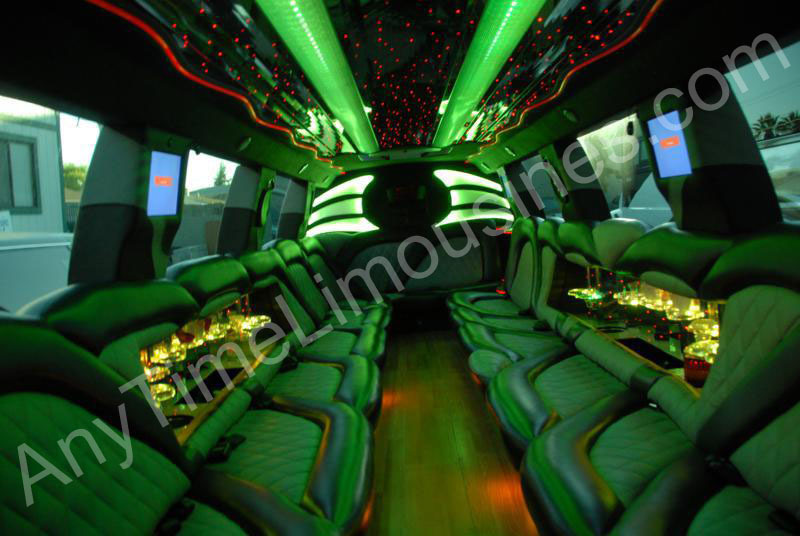 Most limousines follow the basic seating layout. However, the Cadillac Escalade does not. The seating and ambiance give you the perfect vibe of luxury. Providing seating up to 22 passengers, without sacrificing comfort or style. Even the ceilings are majestic! There are geometric displays on the ceilings, Cadillac has left no stone unturned. The Cadillac Escalade and Cadillac Escalade stretch limo speakers and subwoofers are tastefully integrated into the design of the Cadillac, allowing you to play your favorite tracks at unimaginable volumes. 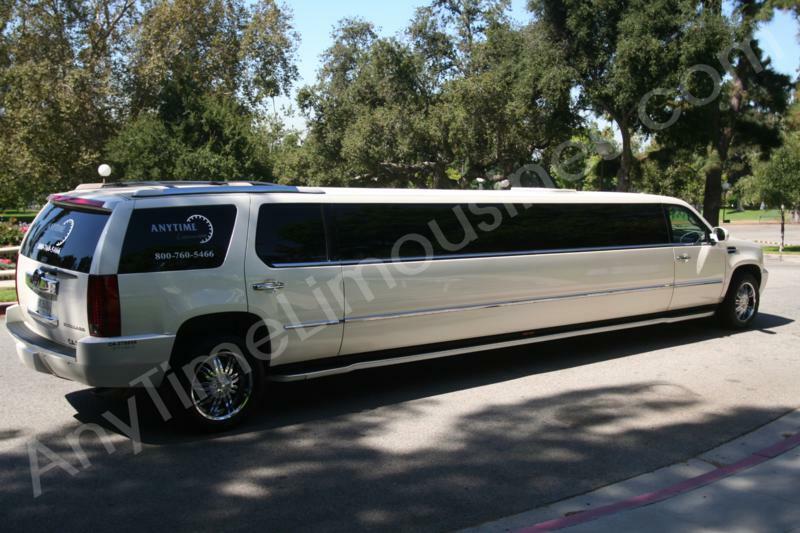 The Cadillac stretch limo is one of our most popular SUV limos for rent! Hardwood floors, stocked wet bar, and custom lighting makes the vehicle a must-have for any occasion. Black, silver, and blue seating wraps around the interior of the Cadillac Escalade SUV. The vehicle holds up to 22 passengers. If you want to make the ultimate statement, the Cadillac Escalade stretch limo is the vehicle for you. Our spacious New Cadillac Escalade is made for comfort. With its stunning craftsmanship with equally stunning comfort. Comfortably accommodating up to 8 passengers with next level legroom, seating, and ample luggage space there is no wonder our Cadillac Escalade pickup is our top rental. There is something special about riding around town in the back of a limo. It provides a certain level of luxury, glamour, and even an elevated appearance. It also allows passengers to enjoy a completely stress-free ride along the way. Anytime Limousines is here to provide you with excellent quality service and enjoyable experience with our fleet of high-quality Cadillac Escalades 24/7 days a week. We look forward to providing the comforts and luxury of our Cadillac Fleet while ensuring an enjoyable experience and safety for you!